Let me start by saying that PASS is a hell of a lot of fun. 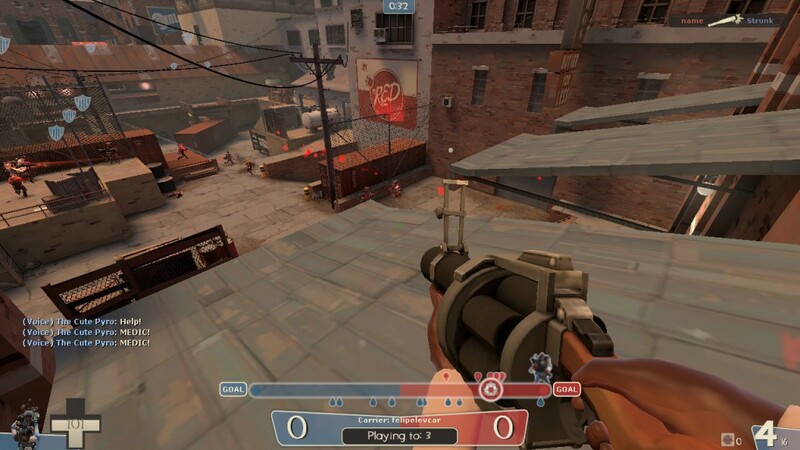 It’s one of the first beta modes that feels like it should be in beta; it’s bizarre and completely different from anything TF2 has tried before, but it’s addicting and condones itself to all sorts of strategies and playstyles that really makes it stand out as a game mode. I genuinely hope this develops its own tournaments and things because it’s just as much fun to watch as it is to play. Everybody is still learning the ropes of this new game mode and there isn’t a lot of strategy yet beyond “scouts on offense, engies on defense”, but that’s what beta is for, and even with my horrible ping and not-gaming laptop I’ve been able to have a good time working with my team to try and score those goals. Here are a couple of strategies I’ve seen players develop. 1. Have a goalkeeper. It might seem like a boring job, but one night when I was hanging back on defense, our team had a pyro who decided his purpose in life was to stand directly in front on our goal and stop anything that came his way. 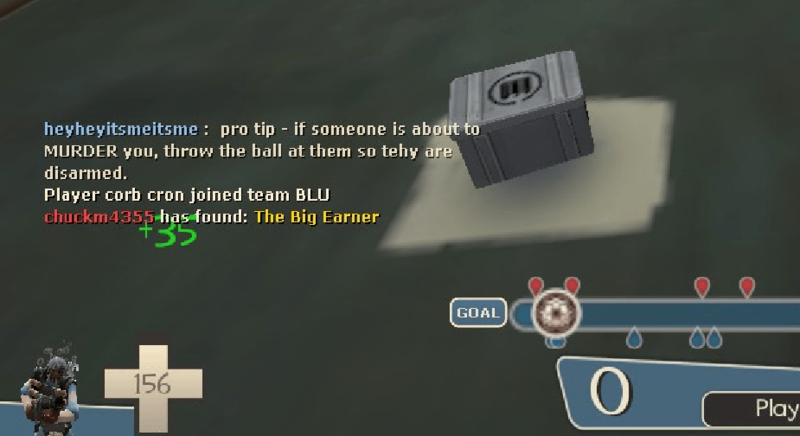 He saved so many goals just by being in the right place at the right time, and he also could defend the sentries with his airblast and flare gun. If you’re willing to play more of a support role, the goalkeeper is just as important as he is in football, and you can feel like you’re doing something even when completely idle. Truly a man of wisdom. 4. Consider going on full sentry-busting duty. 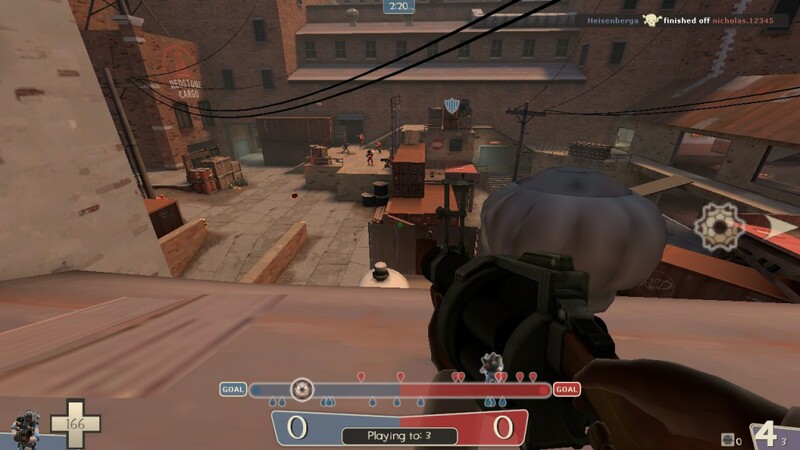 Sentries are a huge roadblock in this gamemode, and the primary job of the non-scouts is to remove the troublesome things so the speedsters can zip in and score those goals. Your team will likely have plenty of players attempting to score, so one reliable player who can pop sentry nests can go a long way towards opening lanes for her team’s offense. This is the roof on the left side of the map, with the small health and ammo pack below it. Crouching behind the chimney will make you immune to Wrangler fire while still letting you hit it with nades. There still isn’t a lot of cover and in general I usually trade my life for every sentry nest I destroy. But you respawn far quicker than the nests do so I often find my efforts worth it. And if you’re wondering, my favorite loadout is Grenade Launcher/Sticky Jumper/Persian Persuader. The only sad thing is that Jumper weapons are not allowed to carry the jack, so I’m completely useless on the scoring front. A gunboats/Direct Hit soldier with better rocket jumping ability than me could probably make great things happen, since the awning is an amazing spot for passing the jack to. In general, my advice leans towards the support roles, because just like in my Medieval article, there are often enough players rushing the objective that I find that role gets adequately covered by default. The best way I can help is by filling less glamorous roles that augment the team, or at least fill a hole. Next Next post: Which Way Does the Wind Blow on Your Favorite Map?